Phone manufacturers have become as adept as the producers of the Star Wars movies when it comes to trickling out information about their upcoming releases, and today we've got another official promo video for the LG G4 to pore over. The LG UX 4.0 Unveiled: Part 2 clip focuses on the camera. There's a Quick Shot mode, for example, that lets you double-tap the button on the back of the handset to take a shot - it even works when the phone is locked. A feature Huawei introduced with the Ascend P7 last year. 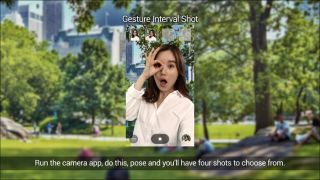 For all you selfie lovers, Gesture Interval Shot lets you take four shots in a row with a wave of the hand. The idea is that at least one of the four is something you're going to be happy to post to Instagram, or wherever. LG UX 4.0 is also going to introduce Ringtone ID, where each contact can have a separate ringtone. It's an option that's been in Android for a while, but it looks like the difference here is that ringtones can be automatically composed as well as manually set. Finally, the video showcases another feature called Quick Memo+ - it lets you easily collect snippets from the web without all of the extraneous adverts and graphics and everything else. All will be revealed on 28 April at the official phone launch, and we'll get to see whether the LG G4 has what it takes to challenge the likes of the Samsung Galaxy S6 and HTC One M9.